WASHINGTON — The Obama administration has confirmed for the first time that Hillary Clinton’s home server contained closely guarded government secrets, censoring 22 emails that contained material requiring one of the highest levels of classification. 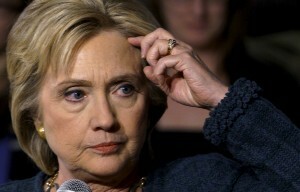 The revelation came three days before the former secretary of state and current Democratic presidential candidate competes in the Iowa caucuses. State Department officials also said the agency’s Diplomatic Security and Intelligence and Research bureaus are investigating if any of the information was classified at the time of transmission, going to the heart of Clinton’s defense of her email practices. The department on Friday evening published its latest batch of emails from her time as America’s top diplomat. But The Associated Press learned ahead of the release that seven email chains would be withheld in full for containing “top secret” information. The 37 pages include messages a key intelligence official recently said concerned “special access programs” -highly restricted, classified material that could point to confidential sources or clandestine programs like drone strikes. “The documents are being upgraded at the request of the intelligence community because they contain a category of top secret information,” State Department spokesman John Kirby told the AP, calling the withholding of documents in full “not unusual.” That means they won’t be published online with others being released, even with blacked-out boxes. Department officials wouldn’t describe the substance of the emails, or say if Clinton sent any herself. Clinton insists she never sent or received information on her personal email account that was classified at the time. No emails released so far were marked classified, but reviewers previously designated more than 1,000 messages at lower classification levels. Friday’s will be the first at top secret level. Even if Clinton didn’t write or forward the messages, she still would have been required to report any classification slippages she recognized in emails she received. But without classification markings, that may have been difficult, especially if the information was publicly available. “This appears to be overclassification run amok,” Fallon said. Kirby said the State Department was focused, as part of a Freedom of Information Act review of Clinton’s emails, on “whether they need to be classified today.” Past classification questions, he said, “are being, and will be, handled separately by the State Department.” It is the first indication of such a probe. Department responses for classification infractions could include counseling, warnings or other action, officials said. They wouldn’t say if Clinton or senior aides who’ve since left government could face penalties. The officials weren’t authorized to speak on the matter and demanded anonymity. Separately, Kirby said the department withheld eight email chains, totaling 18 messages, between President Barack Obama and Clinton. These are remaining confidential “to protect the president’s ability to receive unvarnished advice and counsel,” and will be released eventually like other presidential records. The emails have been a Clinton campaign issue since 10 months ago, when the AP discovered her exclusive use while in office of a homebrew email server in the basement of her family’s New York home. Doing so wasn’t expressly forbidden. Clinton first called the decision a matter of convenience, then a mistake. Last March, Clinton and the State Department said no business conducted in the emails included top-secret matters. Both said her account was never hacked or compromised, which security experts assess as unlikely. Clinton and the State Department also claimed the vast majority of her emails were preserved properly for archiving because she corresponded mainly with government accounts. They’ve backtracked from that claim in recent months. The special access programs emails surfaced last week, when Charles I. McCullough, lead auditor for U.S. intelligence agencies, told Congress he found some in Clinton’s account. Kirby confirmed the “denied-in-full emails” are among those McCullough recently cited. He said one was among those McCullough identified last summer as possibly containing top secret information. The AP reported last August that one focused on a forwarded news article about the CIA’s classified U.S. drone program. Such operations are widely discussed publicly, including by top U.S. officials, and State Department officials debated McCullough’s claim. The other concerned North Korean nuclear weapons programs, according to officials. At the time, several officials from different agencies suggested the disagreement over the drone emails reflected a tendency to overclassify material, and a lack of consistent classification policies across government. The FBI also is looking into Clinton’s email setup, but has said nothing about the nature of its probe. Independent experts say it’s unlikely Clinton will be charged with wrongdoing, based on details that have surfaced so far and the lack of indications she intended to break laws. “What I would hope comes out of all of this is a bit of humility” and Clinton’s acknowledgement that “I made some serious mistakes,” said Bradley Moss, a Washington lawyer specializing in security clearance matters. Legal questions aside, it’s the potential political costs that probably more concern Clinton. She has struggled in surveys measuring perceived trustworthiness and any investigation, buoyed by evidence of top secret material coursing through her account, could negate a main selling point for her becoming commander in chief: her national security resume.